I presented an excerpt of this text as part of Prov(f)talks on November 20, 2014. I’m not sure there is one right way for Christians to understand the environment. If there is, I’m not claiming I know it. Instead, my intention today is to outline my best current understanding. One of the great things about being at Providence is we get paid, in part, to think. 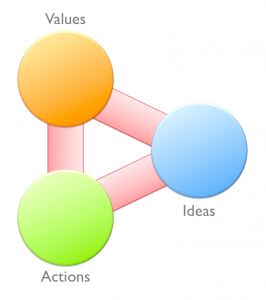 Over the last few years, I’ve been thinking a bit about the relationship between values, ideas and actions—and especially about how changes in one may have an effect on the others. Today I’m only going to concentrate on ideas—not because I think they’re more important than values and actions, but because today’s presentations are brief. 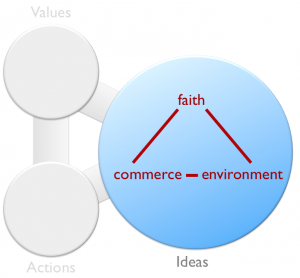 In particular, I’ve been trying to understand the relationship between three clusters of ideas—faith, commerce, and the environment. For today, for the sake of brevity, let’s narrow the topics a bit more. Let’s think, not about faith in general, but Christian faith. And, for today, let’s look primarily at the relationship between Christian faith and the environment, and leave commerce to one side, at least temporarily. To talk about faith means, of course, that I have to wander into territory where I’m not expert—biblical and theological studies. 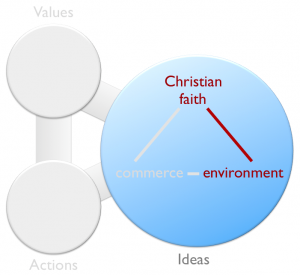 The relationship between Christian faith and the environment was mapped out in our Guest Speaker series last month. And, in particular, it was covered with both depth and breadth by Gordon Matthies. So I think of what I’m saying today as a footnote on Professor Matthies’ talk. “Deliberately do at least one foolish thing every year.” This is one of the sayings I’ve tried to live by over the past while. Of course, we’re human, so we all do much more than one foolish thing each year. But the intent of this little slogan is to do at least one foolish thing each year on purpose—deliberately—with your eyes open. Christians have lots of different views about environmental issues, as we do about just about everything else. Explaining those views in 5 minutes—or less—seemed like an impossible thing to do. So, in keeping with my slogan about foolishness, of course, I said yes. Today I want to show you what I came up with. And then I want to spend a bit of time explaining why I think one of them—what I’m going to call “’accountable’ Christianity” is the most faithful to the biblical text. There are, I’d say, about six different ways that Christians think about environmental issues and the relationship between environmental issues and their faith. I’m naming these six approaches “pantheistic”, “deep green”, “utilitarian”, “apocalyptic”, “individualist”, and “accountable”. Given how presentations like this are usually structured, it’ll come as no surprise to you that I think the first five are either unbiblical, or incomplete, or both, and that I think the last one I’ll present is the one that best summarizes the relevant Biblical texts. However, my intention is not to caricature the first five approaches. They are serious positions, and are held by many Christians. What I think distinguishes these different views is how we understand the relationship between these four entities—God, the world around us, human beings, and our individual self. 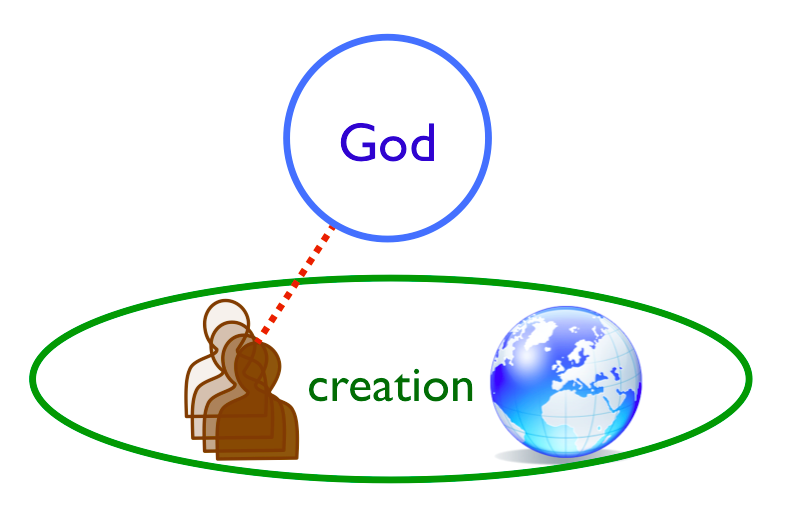 What we might call “pantheistic” Christianity sees God and creation as identical; God and nature are one. The Christian version of this view may have emerged as an attempt to reconcile Christian ideas with Enlightenment thinking in the seventeenth and eighteen century, or with Romantic thought in the eighteenth and nineteenth. In the twentieth century, it seemed to emerge when we attempted to harmonize Christian ideas with other religious traditions into religious pluralism. As nearly as I can tell, there is virtually no basis for this view in biblical texts. One of the core ideas of Abrahamic religions—of Judaism, Christianity and Islam—is that creator and created are distinct. The second view holds that human beings should see themselves as part of nature, as simply one species among all the others. It closely echoes what’s called “deep ecology”, an idea developed in the 1970s, and one that, in my experience, many non-Christian environmentalists hold. “Deep green” Christianity says that the way we are treating the world around us arises from the sin of pride, from arrogance, and from misunderstanding our role in the world. Although I share the concerns of this view about how we are treating our world, I don’t think the bible allows us to see ourselves as simply one creature among many, one species among many. The third approach sees creation in general—and our earth in particular—as an object, given to us by God, to use as we believe to be best. In this view, creation has no intrinsic value; its value arises from its usefulness to human beings. I don’t want us to caricature what I’m calling “utilitarian” Christianity and say that it views creation merely as something to be consumed and thrown away. That, of course, wouldn’t be to the long-term benefit of humans. It wouldn’t be utilitarian. I think a fairer way to describe this view is: It sees God’s sole purpose in creation as providing the raw materials for human well-being. The fourth, which I’m calling “apocalyptic” Christianity, sees the created world as essentially irrelevant to God’s purpose. 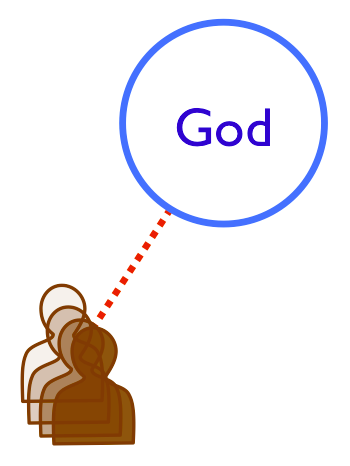 In this view, God’s sole purpose is to save his people for communion with Him in a new creation. The more extreme version of this view might even consider destruction of the earth as a way of precipitating this salvation. But I’m not interested in constructing and then attacking a straw man, or in dealing with the most extreme possible version of this view. The more moderate—and perhaps more serious—idea of “apocalyptic” Christianity is to see discussion about creation and the environment as distractions from more fundamental or urgent issues—in particular to focus on the relationship between God’s people and God himself. 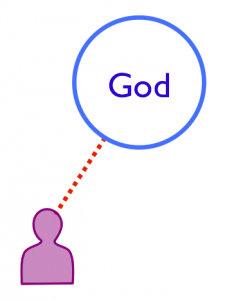 The fifth sees the essential spiritual relationship as personal—between my self and my God. I don’t pick these lyrics to denigrate them. I pick them because I love—and am moved by—all three of these songs. But I do think they exemplify an individualist approach to Christianity. In my view, the individualist approach, like the apocalyptic, isn’t in contradiction to biblical texts so much as it is incomplete. It focuses on portons of the Biblical texts and ignores others. 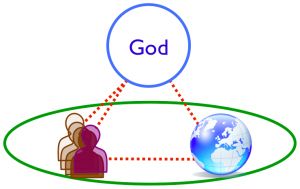 The sixth view—”accountable” Christianity—holds that God is in relationship with us, both as individuals and as members of community. He is also in relationship with creation. In this view, human beings have a responsibility—both individually and corporately—for God’s creation, and are accountable to him for how well we fulfill that responsibility. In my remaining minutes, I hope to sketch out why I think “accountable” Christianity is more biblically faithful than the other approaches. My intention here is not to develop a new theology of our responsibility for care of creation. It’s my contention that we do not need a new theology, that the relevant biblical texts are already sitting in front of us—hiding plain sight. I am proposing, not a new theology, but an old one: To read the Bible seriously, and to shape our values, ideas and actions to its guidance. You might call a conservative theology; you might even call it fundamentalist. I see three themes running through biblical texts that, I think, call us to hold the view about the environment I’m calling “accountable Christianity”. 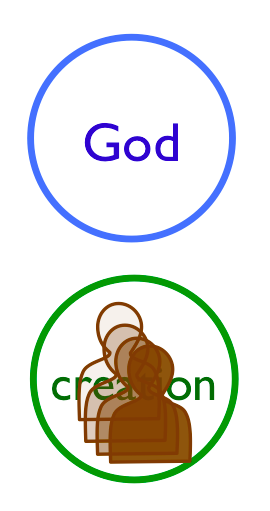 The first theme is: God owns all creation. …everything in heaven and earth is yours. It would be a mistake, I think, to simply categorize these passages as poetic or metaphorical. They are poetic, of course. But I think we should also accept that they mean what they say. 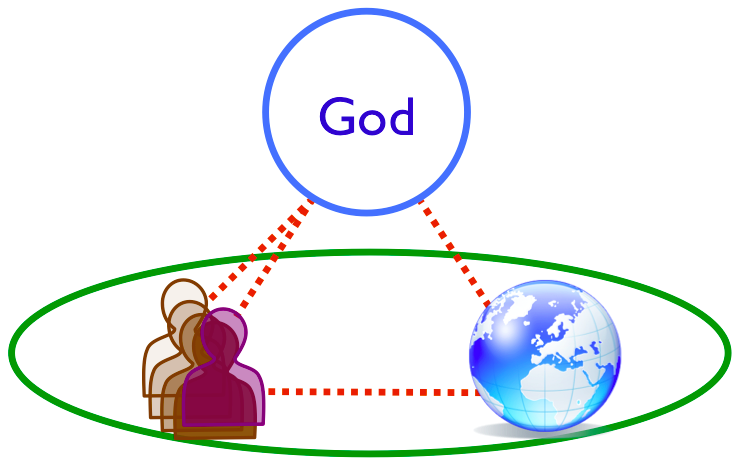 It is also relevant that God’s ownership is not contingent, but absolute. Human ownership, however, is contingent. One way to understand the Year of Jubilee is as a mechanism for wiping away the illusion that human authority over the land is absolute, and making God’s absolute ownership visible again. Of course, God as creator of all that exists pervades Biblical texts. 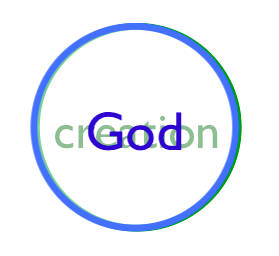 But, if we characterize Him as only creator, I think we’re cutting away significant texts. We are familiar with seeing God as creation’s redeemer. Those of us familiar with Wisdom, Augustine, or the Catholic catechism may also think of God as the sustainer of creation. But we also need to recognize Him as owner. 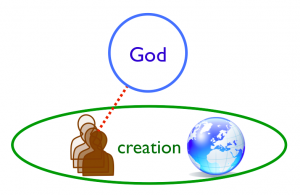 The notion that God made the world and then let it run on its own is foreign to biblical views of the relationship between creator and creation. And the notion that God created the world, and then handed it off to people to do with as they pleased is equally foreign. To be faithful to the text, I think we need to see God, not as the former owner, but as current owner. But if God is the current owner how, then, are we to understand human dominion? If we were to compile a top 10 list of the most misinterpreted verses in the Bible, this verse would be on it. What the NIV translates as “rule over”, the King James Version translates as “have dominion”. The Hebrew word is רָדָה (radah). If you are troubled by how human beings are treating creation, you may be tempted to ignore this verse. Or you may look to soften the translation, to play down how much authority we are given. I’m not in favour of ignoring Bible verses—especially not the ones that make us uncomfortable. In fact, I’d argue that those are exactly the ones we should pay the most attention to. And even a cursory review of how radah is used elsewhere in biblical texts makes softening the meaning in Genesis untenable. A better approach, I think, is to take Genesis 1:26 and it’s meaning seriously. Genesis 1 tells us that God has made us rulers of his creation. Genesis 2 restates that idea when it has God bringing all the animals to the man to name. Genesis 6-9 emphasizes it again when God gives Noah the role of preserving all animals (and all animals’ food) in the ark Noah creates. But no-where in any Biblical text are we told that we have the right to rule any way we choose. The love God gives us is unconditional, but the authority he gives us is not. If you fear the Lord and serve and obey him and do not rebel against his commands, and if both you and the king who reigns over you follow the Lord your God—good! But if you do not obey the Lord, and if you rebel against his commands, his hand will be against you, as it was against your ancestors. We see the king’s bounded authority again in 2 Samuel, when the Lord sends Nathan the prophet to rebuke Daniel. I’ve drawn both of these examples of God holding rulers to account from First and Second Samuel, but I don’t want you to think it’s something peculiar to those two books. To rule is to be held to account. Jesus doesn’t talk about accountability just with his disciples, but also in parables. We can see this in his parable on entrusting wealth to servants (Matthew 25; Luke 19), and in the parable on entrusting a vineyard to tenants (Mark 12; Matthew 21). We’re used to thinking that we will be held to account at the final judgment, but I think it’s pretty clear that we are accountable, not only in the future, but also in the present. There are other Biblical texts that emphasize our accountability as followers of Christ, but I think I’ll leave them for you to search for. Who then is the faithful and wise servant…? And, if you accept my view these are relevant to working out a relationship between Christian faith and the environment, it is right, I think, for us to ask ourselves: When it comes to the earth, have we been faithful and wise servants? If we go back to Genesis, we can see the kind of earth God intended. And so, let’s ask ourselves, does the water still teem with living creatures, do the birds still increase on the earth? A world teeming with life is the world God created, and intended, and judged to be very good. Is that the world over which we now rule? Let me take only one example—the cod fishery off Newfoundland. Particularly in the 60’s, we took out much more than the population could sustain. Even worse, throughout this period, the way we fished destroyed the cod’s habitat so that, by the 90’s, the population crashed. I think it’s fair to say that the collapse of this fishery was not what God intended for his creation. And, if the evidence shows human beings had a hand in this collapse, then I think we must admit that humans were rebelling against God’s will. And, of course, the northeast Atlantic cod fishery isn’t an isolated example. 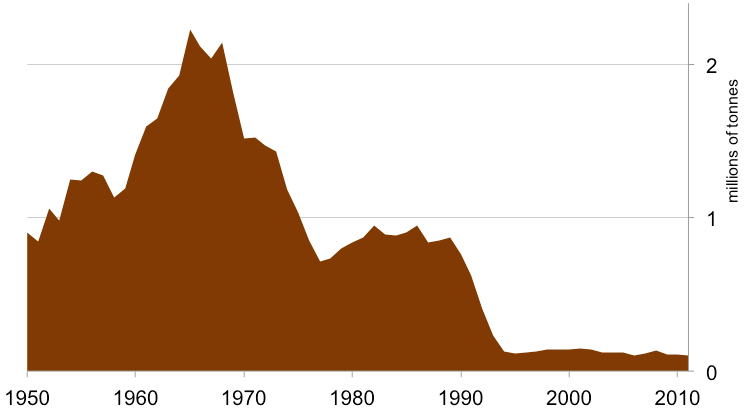 The volume of fish in the oceans appears to have declined by 40% in only the past 50 years. And, of course, our actions aren’t affecting only fish. The evidence is convincing—at least to me—that we are altering the earth in significant ways. The way we take resources from the world—and, just as importantly, how we return our waste to it—I believe violates God’s plan for his creation, and goes against his requirements of us. It seems to me that how we have acted as rulers of God’s creation falls far short of God’s plan. While this is, I hope, a sober assessment of our failures, please don’t interpret it as one of despair. We are not helpless in the face of our failures. God has given us authority, but he’s also given us the ability to act. There is a great deal we can do. And this why I think it is important to understand the connections between these three spheres—between our ideas, our values and our actions. I’m not suggesting our actions can save or redeem us. But my experience is that taking action can help us flesh out and deepen our ideas. And the actions we take can help us live out our values. They are how we respond to the responsibility God has given us. Faith by itself, if it is not accompanied by action, is dead….Was not our father Abraham considered righteous for what he did when he offered his son Isaac on the altar? You see that his faith and his actions were working together, and his faith was made complete by what he did. My experience in working with non-Christians who are concerned with the environment is that, if they know I’m a Christian, they will judge my faith by my actions. What I say will matter very little, but what I do will matter a lot. And they will judge, not only my individual actions, but also the actions I take as a member of the larger community. This can be sobering, because I know my actions always fall short of righteousness. But, in a world skeptical of Christianity, our actions are usually the most powerful form of evangelism we have. Providence University College Guest Symposium, October 29, 2014. Gordon Matties. October 29, 2014. “Beyond Sustainability and Salvation: A Biblical Theology for a Groaning Creation”. Excerpts from The Bishop’s Voice: Selected Essays, 1979-1999 by Bishop John Shelby Spong, compiled and edited by Christine Spong. Accessed December 31, 2014 from http://www.spiritualityandpractice.com/books/excerpts.php?id=13409. Perhaps the best easily-available summary of Deep Ecology is on Wikipedia: http://en.wikipedia.org/wiki/Deep_ecology. Christy Nockels, Daniel Carson, Jesse Reeves, Kristian Stanfill, Matt Maher. 2011. Lord I Need You. sixsteps Music (administered by Capitol CMG Publishing). Accessed December 27, 2014 from https://ca.songselect.com/songs/5925687/lord-i-need-you/viewlyrics. Jonas Myrin and Matt Redman. 2011. 10,000 Reasons (Bless The Lord). Said And Done Music (administered by Capitol CMG Publishing). Accessed December 27, 2014 from https://ca.songselect.com/songs/6016351/10-000-reasons-bless-the-lord/viewlyrics. Chris Tomlin, John Newton, and Louie Giglio. 2006. Amazing Grace (My Chains Are Gone). sixsteps Music (administered by Capitol CMG Publishing). Accessed December 27, 2014 from https://ca.songselect.com/songs/4768151/amazing-grace-my-chains-are-gone/viewlyrics. All biblical quotations, unless otherwise indicated, are from the New International Version. “Let us therefore believe that God works constantly, so that all created things would perish, if his working were withdrawn.” Augustine of Hippo. On Genesis. Translated by E. Hill. The Works of Saint Augustine, part I, vol. 13. Brooklyn: New City Press, 2002. …you must not rule over your fellow Israelites ruthlessly. (Leviticus 25:43. See also Leviticus 25:46,53). John Mason, A Briefe Discourse of the New-Found-Land (Edinburgh: Andro Hart, 1620), pages not numbered. FAO Fisheries Department (FAO- FI), “Review of the state of world marine fishery resources 2011. Marine resources – Northwest Atlantic, 2009. FIRMS Reports.” in Fishery Resources Monitoring System (FIRMS) (Rome: FAO, updated 12 June 2013), accessed December 31, 2014, http://firms.fao.org/firms/resource/10532/en. World Wildlife Fund. Living Plant Report 2014. http://bit.ly/1ssxx5m.